In the Eastern Amhara Region of Ethiopia, families have struggled with the effects of climate change, drought, poverty and severe food insecurity – but Canadian support has made a huge difference. Over 8,000 families – that’s 40,000 people – have improved their lives through the MILEAR project, funded by the Government of Canada and generous supporters like you. As the MILEAR project comes to an end this year, here are 3 ways you’ve made an impact. Madam Ansha’s harvests have doubled thanks to the gift of seeds. Ansha has seen more than a few tough harvests. 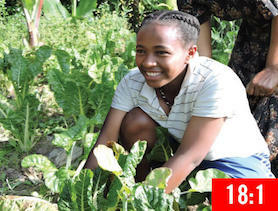 Before the MILEAR project, she worked as a labourer on neighbour’s farms, and only grew crops at a subsistence level. But it wasn’t enough to feed her seven children, or to pay for their education. 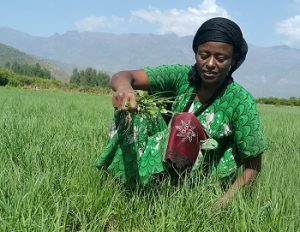 Through the project, she received a new type of seed called Boset, which is a climate-resistant, high-yielding variety of teff. 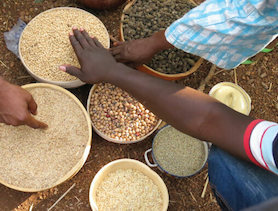 For the first time, she could not only grow enough food for the family, she could also sell some of her crop for profit. 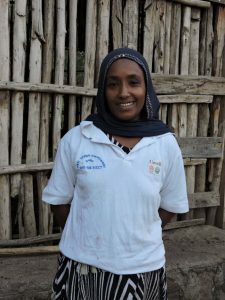 With her earnings she’s invested in livestock and land, and most importantly, now sends all of her children to school. “The quality of my living has changed. I am able to feed my children better than before, buy them clothes, and keep their personal hygiene,” she says. As a labourer who had only ever grown food to feed his family, Hussein’s family risked severe hunger when drought hit Ethiopia a few years ago. That all changed when he learned irrigation through the MILEAR project. As a new community well was being dug, he decided to get a headstart on irrigating his land himself. 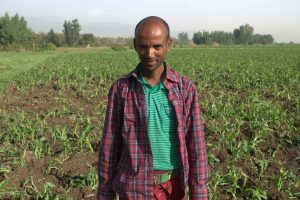 By the time the well was completed, he had already harvested a crop of beans that earned him 40,000 birr (roughly $2,660 CAD). Now Hussein’s farm has expanded to include livestock, and his children are well provided for. Best of all: “I am able to buy food grains such as sorghum enough for the year for my family to eat,” he told us. By supporting the MILEAR project, you’ve helped children have their best chance at a bright future, supported by a family earning a stable income, with enough nutritious food to eat year round, and a chance to go to school. This could not have been possible without the support of generous Canadians like you. Thank you! The Market-led Improved Livelihoods in Eastern Amhara Region (MILEAR) project is a five-year, $7.64-million project funded generously by the Government of Canada and private donors.